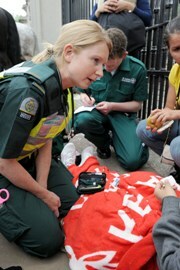 As hundreds of thousands of well wishers celebrated the Royal Wedding along the procession route and across the capital, London Ambulance Service staff ensured that everyone got the medical care they needed. 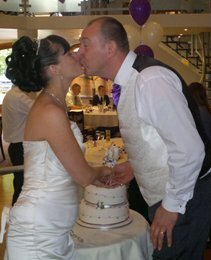 A NEWLYWED couple will jet off on their honeymoon tomorrow (Friday), after a quick-thinking ambulance crew and doctor saved their big day. The London Ambulance Service is gearing up for this week’s Royal Wedding celebration. A woman involved in a serious motorcycle crash has been reunited with the ambulance staff who helped to save her life by taking her directly to one of the capital’s major trauma centres – exactly a year after they opened. 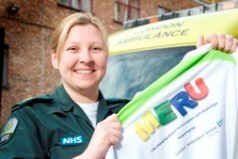 Fifteen London Ambulance Service staff have trained hard over the last few months to take part in this weekend’s Virgin London Marathon in aid of the Chief Executive’s charity, MERU. 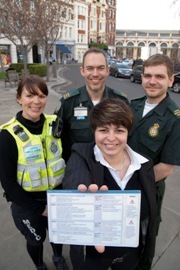 The London Ambulance Service is launching its five year cost improvement programme this week (11 April) to make savings of over £53m. The London Ambulance Service has won the ‘outstanding service’ and the ‘control room’ awards at the first Emergency Service Awards. 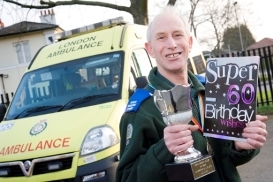 Proving getting older doesn’t have to slow you down, a patient transport worker from London marked his 60th birthday by completing his 250th marathon.